Home » Emotional Intelligence » Relationships / Marriage » How Many Friends Can We Really Have? In today’s world, when you can have 4,000 “friends” on Facebook, it is hard to determine the true definition of friendship. Knowing 4,000 people (and even only 1,000) does not mean you are friends. It means you know of, or maybe even have been acquainted with, that many people. Sometimes, you share nothing in common other than you happen to have a mutual contact. You might not have even met! Professor Robin Dunbar, an anthropologist at the University of London, tried to find the answer to the question “How Many Friends Can We Really Have?” He found that there is a limit to how many friends we can have with whom we can maintain meaningful relationships. 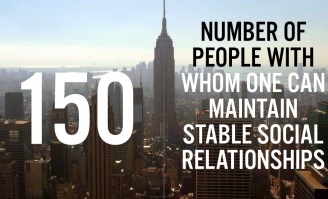 Dunbar claimed that we can only have relationships with an average of 150 people for them to be considered stable, effective social relationships. This is called Dunbar’s Number. Dunber published his theory in 1990. He found a correlation between the size of a person’s brain and the size of his or her social network. He argued that a person’s social circle can only ever be as big as the human brain allows: 150 people. Years later, anthropologists H. Russell Bernard and Peter Killworth claimed that the largest number of friends we can have is closer to 231. No researcher has ever been able to find this result again. In any case, no one has ever come close to managing the number of Facebook “friends” or social media contacts that people have. Some companies and successful businesses around the world adopted Dunber’s Number as the basis for their personnel structure. They build their companies around that number to make sure that the relationships between workers are the best they can be. When a department or section grows beyond 150 employees, it is divided to keep the work environment social. Whether you believe that the largest number of friends you can have is 150 or 231, both studies highlight the idea that in friendship, quality, not quantity, is what counts.